If you don't wake up in the morning and skip out of bed to face the day, there is something wrong with your life. 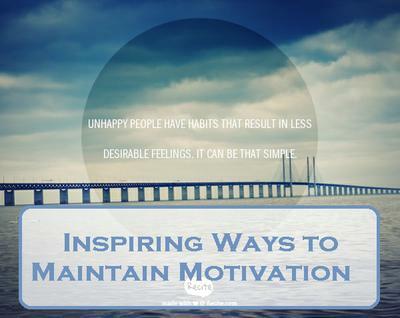 Sorry to say it, but you need know how to maintain your motivation if you want to succeed in life and be happier. And we all want to be more happy, don't we? The good news is that you don't need to wait until you are a retired millionaire before you can be truly happy. You just need to know how to enjoy your current life MORE, while you are traveling on your current journey... right now. Learning how to maintain your motivation every day is key to that! It puts that spring in your step, and that smile on your face that makes life worth living and obstacles worth overcoming. When it comes to getting the small daily tasks and the big life goals accomplished, motivation can be hard to come by. Yet, motivation is exactly what is needed. But how do you manufacture motivation when you have none? If you fail to complete a particular task, what damage will be done? It might just be the inconvenience of having even more to do the following day. Or it could be the prospect of someone dropping by and seeing how filthy your home is. Saving $25 this week might not be too exciting, but the vacation you'll be taking next year is pretty great. Remind yourself of all the benefits you'll receive. Make a long list that will help to keep the fire burning inside to successfully deal with those unpleasant or boring tasks. Visualize the future you expect to enjoy from getting your tasks completed. Rehearse your successes in your mind. Create an image that motivates you take the next step enthusiastically. It's hard to stay motivated for more than 8-10 weeks. So, if you have a goal that will require a year to accomplish, you'll run out of gas before you're successful. Break goals that take an extended amount of time into smaller goals that can be accomplished within two months. 4. Make the task more enjoyable. Raking the leaves might sound like a dreadful way to spend the afternoon, but what if you listened to your favorite album on your iPod while you raked? You could invite a few friends over for a barbeque and ask them to bring a rake. Ask yourself, "How can I make this task as enjoyable as possible?" and then listen to the answers you receive. 5. Give yourself a reward. You wouldn't go to work each day if you didn't get paid. The reward you receive is enough to keep you going back each day. Apply the same idea to keep your motivation high enough to get things done. Think of a few things you truly enjoy and use them as motivation. Just feeling proud and pleased with your progress can be a form of reward. Those that struggle with motivation are often hard on themselves. Be happy with your progress and you can expect to enjoy more progress in the future. 6. Take a deep breath. Few things will drain your motivation faster than an over-stimulated mind. Stay clear on what you're trying to accomplish and focus on the most direct path to get there. Deal with one task before moving on to another. Going to the gym each day can be challenging. But if you know your workout partner is waiting for you, it's more difficult to stay home. The presence of others can increase your level of commitment. Reach out to a friend. Without motivation, willpower is the only solution. Willpower is much more difficult to sustain than motivation. Learning to control your motivation is part of learning to control yourself. It is one of THE most important life skills that you grow and develop in your life, so make it a personal development priority! There's little that can't be accomplished once you learn how manipulate your level of motivation. Even the most challenging tasks become manageable.